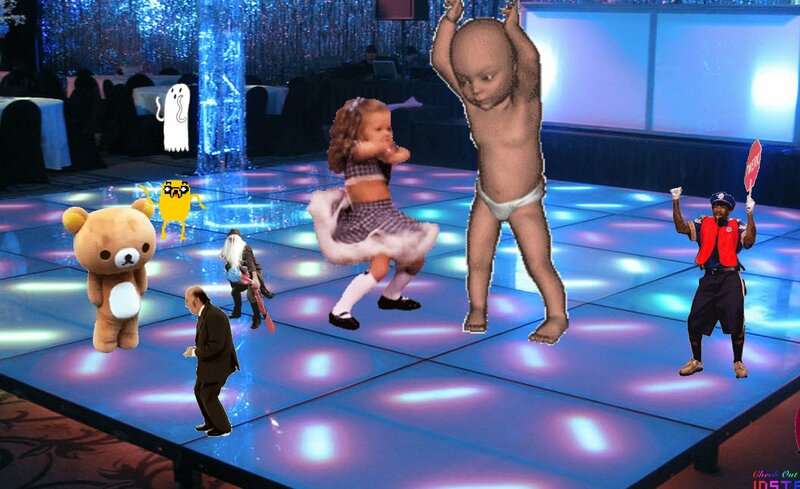 There's even a dancing baby! It's based on a mobile installation for hire that prompts your guests to turn themselves into loops that they can then drag around on a virtual stage. Even though it dates from 2012, I found it weirdly addictive today, and that was before my kid got out of bed and started playing with it, and I had to wrestle the computer away from her. Here's the party I made. Welcome to GIF DANCE PARTY INSTALLATION. Created with lots of love/code by Fuzzy Wobble, Wes, Joe, and Matt in an effort to bring an experiential party installation that goes far beyond the familiar photo/gif booth. We have ventured into a world of interactive / looped / reversed / cloned / collaborative / pelvic-thrusting / dancing / comical / chaos -- creating a memorable party experience for everyone. This project was released recently, in May 2015, and stems from the viral website http://gifdanceparty.giphy.com/ created by Fuzzy Wobble back in 2012.